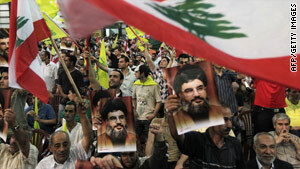 Lebanese earlier this week celebrated the 10th anniversary of Israeli troops' withdrawal from southern Lebanon. (CNN) -- The Lebanese army fired anti-aircraft guns on Israeli warplanes Wednesday after what it said were repeated violations of Lebanese airspace, state media reported. "The Israel Defense Forces does not comment on Israeli Air Force activity or rumors regarding it," an IDF spokeswoman said.